268 pages | 3 B/W Illus. Climate Change already having serious impacts on the lives of millions of people across the world. These impacts are not only ecological, but also social, economic and legal. Among the most significant of such impacts is climate change-induced migration. The implications of this on human rights raise pressing questions, which require serious scholarly reflection. Drawing together experts in this field, Climate Change, Migration and Human Rights offers a fresh perspective on human rights law and policy issues in the climate change regime by examining the interrelationships between various aspects of human rights, climate change and migration. Three key themes are explored: understanding the concepts of human dignity, human rights and human security; the theoretical nexus between human rights, climate change and migration or displacement; and the practical implications and challenges for lawyers and policy-makers of protecting human dignity in the face of climate change and displacement. 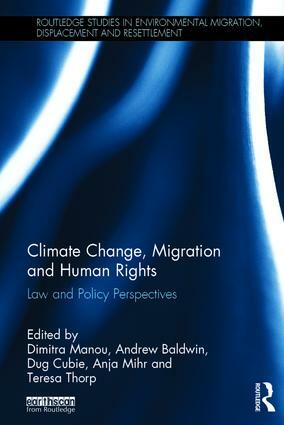 The book also includes a series of case studies from Alaska, Bangladesh, Kenya and the Pacific islands which aim to improve our understanding of the theoretical and practical implications of climate change for human rights and migration. This book will be of great interest to scholars of environmental law and policy, human rights law, climate change, and migration and refugee studies. Andrew Baldwin is a Senior Lecturer in the Department of Geography, Durham University, UK. Dug Cubie is a Lecturer in the School of Law, University College Cork, Ireland. Dimitra Manou is a Senior Researcher in the School of Law, Aristotle University of Thessaloniki, Greece. Anja Mihr is the Programme Director of HUMBOLDT – VIADRINA Center on Governance through Human Rights, Berlin, Germany. Teresa Thorp is CEO & Principal, Insight International (International Trade & Environmental Lawyers & Economists).